Is Russia’s Victoria Komova a diva? When applied to a woman in the public eye, the term diva can convey two very different meanings. In the positive sense, we prize the diva’s extraordinary talents and revel in her ability to command an audience with presence and poise. But in other cases, diva is a term of derision, a put-down for a woman who, though skilled, has overstepped her place by being too assertive, demanding, or emotional. As Hanna Rosin mentioned in her post on Sunday’s Olympics gymnastics competition, NBC’s commentators fixated on the young women’s displays of emotion, taking particular note of reigning world champion Jordyn Wieber’s briefly tearful reaction to the news that she would not advance to the all-around final. The diva appellation is not new in gymnastics. As Meghan O’Rourke pointed out in Slate back in 2004, some athletes have relished the term, most notably Russia’s Svetlana Khorkina. But while Khorkina owned the label and spoke openly of her pride in it, her successors were labeled by a bunch of men without getting the opportunity to comment themselves. The whole thing read as paternalistic and, in the end, unnecessary. That “these girls are very emotional,” as NBC’s Tim Daggett put it, should be neither here nor there. After all, when Michael Phelps and his teammates express diva-like torrents of emotion poolside, their whooping and grimacing—if it’s noticed at all—is deemed nothing more than uncomplicated masculine enthusiasm. If we’re going to start policing an athlete’s emotional responses during what is arguably the most important competition of her career, we should at least be equal in our application of the criteria. 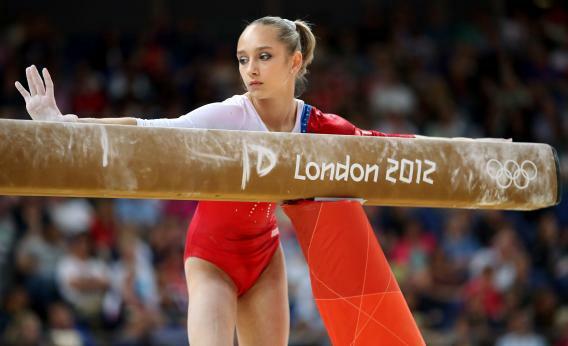 A young female gymnast is a diva for being a little self-possessed? Fine—then diamond-grilled Ryan Lochte is the biggest prima donna of them all.